Thanks for this list. Number 29 is incredibly important. No matter how small it helps unlock your thinking to just get one thing done ... even if it's just a load of laundry. Number 8 and 9 are so vital to my own life! It seems that coffee opens the soul and freshens the spirit tenfold. Thanks so much for this list, I sometimes get so hard on myself (#5 is definitely one I should work on!) and think I may be unimaginative or boring but creativity must begin within myself, first and foremost. Never stop changing!! Marie Cooper Marie Cooper Thats great too! Huub Koch Great list! I especially like #'s 20 and 21. It is so hard to take risks, but so rewarding! Thank you for this. By the way, my grandfather was from Rotterdam. Obvious its an error by mobypicture that comments are posted twice. @natalie ford A framework is meant to include something. The case involved, is usually more complex, detailed or important than the frame. The framework can serve as containment, shielding or protection, or even to clarify or embellish. Huub Koch P.S. no idea why my comments are posting twice - I only hit the button once! Huub Koch That wikipedia page for Framework did not really help I am afraid. I am still not sure what you mean (no. 24). BTW, retweeting! Huub Koch Easy to do creative ways. Huub Koch Love the list especially the last two. May I repost with link back on my blog http://kvictoriasmith.blogspot.com/ and share with my writer friends? Cutting down clutter improves efficiency because it empties your mind and thus creates room for new visions. 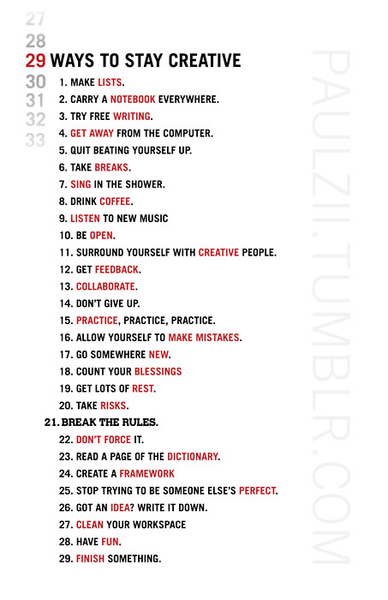 Really liked this list--I'll finish this comment and thus achieve point 29! no 21. made me smile. I'm a big fan of 26--writing ideas down immediately takes the pressure off and lets you churn out others, rather than relying on remembering the half-idea. By the way, why no 27 - Clean your workspace? Despite the obvious, it would seem that some people function quite fine with clutter--have any links for why cutting down clutter improves efficiency? Cheers for the post --good work.